During the eighties, Blokland designed the lettering of a number of monuments, among which the Homomonument at the Westerkerk in Amsterdam. During that period he worked together with the famous sculptor Frans de Wit on a number of monuments for the city of Leiden. Also around that time Blokland started to cut letters in stone. Blokland set up the television course Calligraphy, the art of writing in 1989 and wrote the accompanying book, of which 16.000 copies went over the counter in the early 1990s. Further since the 1980s he has written some 150 articles on type design and font production for various graphic and design magazines, like Compres, Pers, PrintBuyer, Hamburger Satzspiegel and Page. During the 1990s Blokland worked closely together with the design agency Hazelhoff de Vaal & partners on a number of logo’s and mastheads. Blokland purchased his ﬁrst computer in 1983; it was an Acorn Electron. He programmed a simple tool for digitizing vectored letters, and for subsequently interpolating and modifying these. 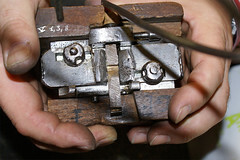 It was baptized ‘DrawMonkey’, which is the direct translation of the Dutch ‘Tekenaap’, i.e., a pantograph. For getting output other than on the screen, at that time one had to be quite inventive to get printers connected, eproms installed, et cetera. Although DrawMonkey in all its simpleness functioned well (see image above), Blokland realized back then that others were better equipped for programming than he was, as he himself was more skilled in designing type. That insight formed the basis for the later long-lasting cooperation (since 1991) with the programmers at URW(++) in Hamburg, Germany, which eventually resulted in the DTL FontMaster tools. After years of preparation, in 1990 Frank E. Blokland founded the Dutch Type Library, the ﬁrst and nowadays largest producer and publisher of digital typefaces in the Netherlands. A couple of years later he initiated and supervised the development of DTL FontMaster, a set of utilities for professional font production jointly developed by DTL and the Hamburg-based company URW++. Blokland has designed typefaces like DTL Documenta, DTL Documenta Sans, DTL Haarlemmer (on the basis of drawings by Jan van Krimpen), DTL Haarlemmer Sans and DTL Romulus (also based on drawings by Jan van Krimpen). For roughly a decade the seriffed and sans versions of DTL Documenta formed the corporate identity typefaces of the famous Rijksmuseum in Amsterdam, the Netherlands. The typeface was used for the signage in- and outside the museum, publications, annual reports, et cetera. DTL Documenta has been applied in Gotteslob, the new prayer and song book of the Catholic church in Germany and Austria.The production of the 3.6 million copies (1,300 pages each) required eight tons of red ink and roughly 3,000 tons of light-weight paper (40 grams). 260,000 copies of the Luther Bibel 2017, typeset in DTL Documenta, were printed for the Evangelische Kirche in Germany end of October 2016. Since 2010 new street signs are placed in the city of Haarlem for which DTL Haarlemmer is used. The design agency Bureau Arjan Karssen selected the seriffed version for the street signs in the historic city centre, and the accompanying sans serif is used on two different signs for the pre- and post World War II parts of the city. When Gerrit Noordzij retired in 1987 from the Royal Academy of Art (KABK) in The Hague, Blokland was the ﬁrst of the younger generation to succeed him. As Senior Lecturer Blokland now teaches writing, letter drawing, and type design/font production to the graduate and post-graduate courses at the Graphic Design department. Just before the reception (and in front of the poster announcing it) to celebrate 30 years of lecturing at the KABK’s Graphic Design department on 19 December 2017. In 1995 he was asked to become a professor at the Plantin Society in Antwerp. Further he has lectured as a guest professor at institutes like the Technical University of Delft, the University of Reading, and Lahti Polytechnic University. In 2004–2011 Blokland designed the lettering for the newly restored stained glass windows of the St. Peter’s Church in Leiden, the Netherlands. On YouTube a short ﬁlm (Dutch spoken) shows the restoration of the church, and the design and production of the lettering. April 2013 Blokland designed the calligraphic lettering of H.M. Queen Beatrix’s Abdication Act. The letters on the act, in Humanistic Minuscule and Italic hands, with all their contextual letter-variants, were written by Blokland and transferred by himself into two digital fonts: Abdicatie Regular and Abdicatie Italic using the DTL FontMaster tools. 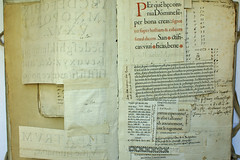 The text was subsequently silkscreened on parchment. Sumer 2016, as guest curator Blokland arranged the display of Renaissance type-foundry material (in relation to digital font technology) at the historical type foundry of the Museum Plantin-Moretus. 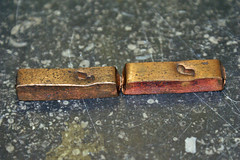 He did this together with Kris Geysen, who is curator of printed material at the museum. 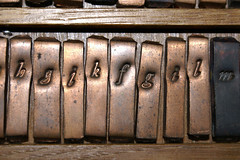 Blokland also wrote the texts for, and designed the panels on the type-foundry’s wall. On 11 October 2016 at 11:15 a.m. Blokland successfully defended his PhD dissertation at Leiden University. 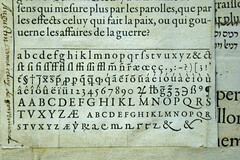 Blokland’s research was conducted to test the hypothesis that Gutenberg and consorts developed a standardized and even unitized system for the production of textura type, and that this system was extrapolated for the production of roman type in Renaissance Italy. For the production of roman type in Renaissance Italy, Humanistic handwriting was adapted to a ﬁxed standardized and even unitized system for the production of textura type that was developed by Gutenberg and his peers. Outcomes of this research have been translated a set of Python extensions for Glyphs and RoboFont, named LS Cadencer and LS Cadenculator, developed by type designer Lukas Schneider in cooperation with Blokland. These tools can be used for (batch) auto spacing and analysis, which is based on the intrinsic underlying patterning in roman and italic type. This software can be used to replace optical spacing completely or it can be applied supplementally to spacing by eye. May 2018 the University of Split, Croatia, published Osnove oblikovanja pisma, a book on type-design fundamentals by Dr. Nikola Djurek and Blokland. On the one hand it combines elements of Blokland’s calligraphy course book from 1990 with his more recent research into the origins of the harmonics, patterns and dynamics in movable Latin type. On the other hand it contains information from Djurek’s PhD dissertation on the history of and conventions for Croatian diacritics with his ongoing research on the history of Croatian scripts (Glagolitic, Cyrillic, Latin).